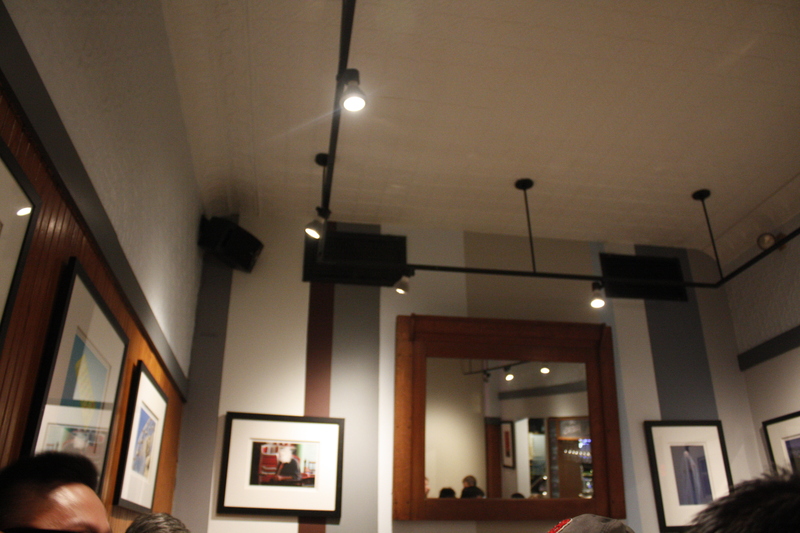 After our older sister and her close friend’s glowing views about their visit to Maslow’s Strip T‘s in Watertown, we were just waiting for the right opportunity to go. With pedigree from French Culinary Institute and David Chang’s Momofuku Ssäm Bar (BMH’s visit to Momofuku Milk Bar), expectations were high, and Strip T’s team delivers. Overall, our party and our bellies went home happy and that is all that matters. 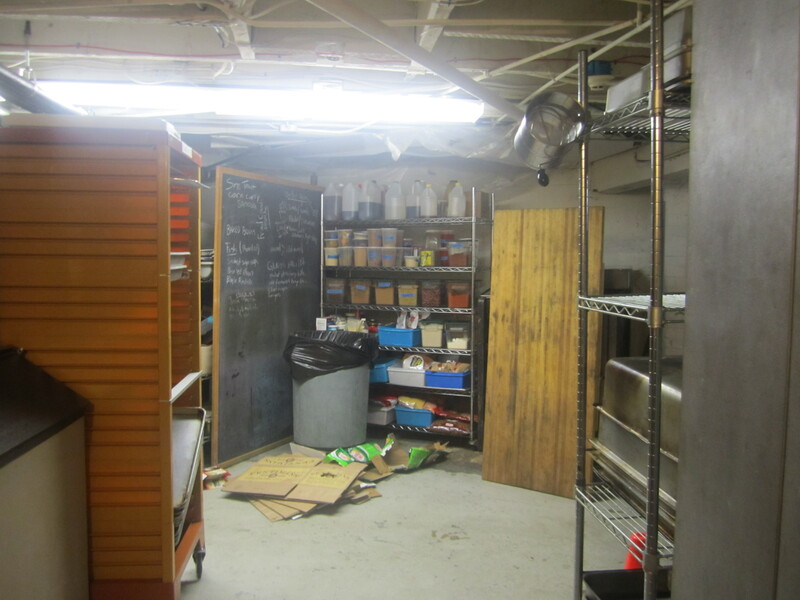 Every item has an intensity of flavor from tangy, umami to porky. A majority of items displays Maslow’s homage to Asian cuisine and techniques and his groundings with David Chang. From buttermilk fried chicken with the chicken’s claw left in tact (Chinatown style), to miso flavored mayonnaise to spicy Vietnamese sandwiches, we appreciate Maslow’s creative edge, infusion of cultures and constant element of surprise. 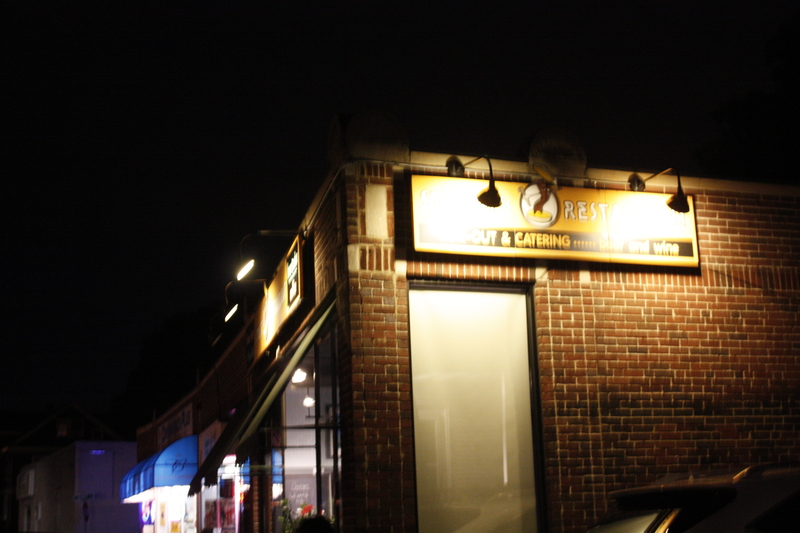 The chill vibe, dinning area, low key atmosphere is worth the off the beaten track journey. 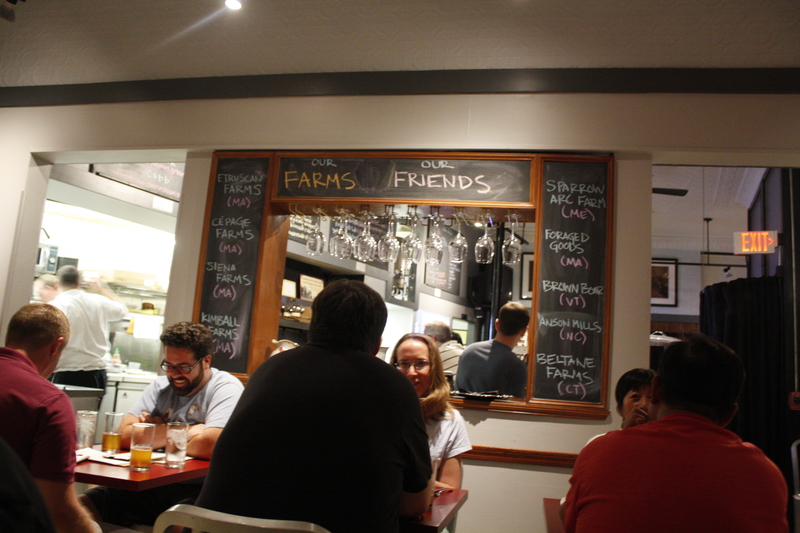 The chalkboard made us reflect on the concept of eating locally and listed the various relationships with farms where the ingredients from the menu came from. 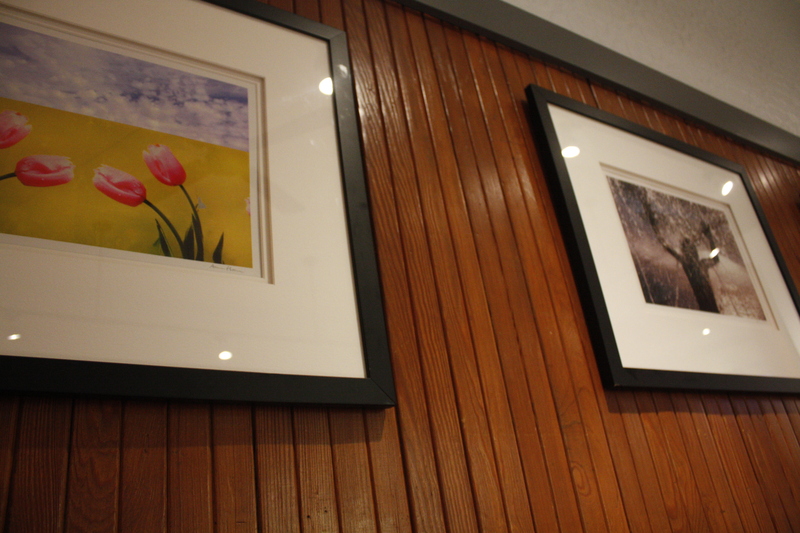 We appreciated the wood paneling, mirrors, chalkboard, art on the wall and the peak into the kitchen. 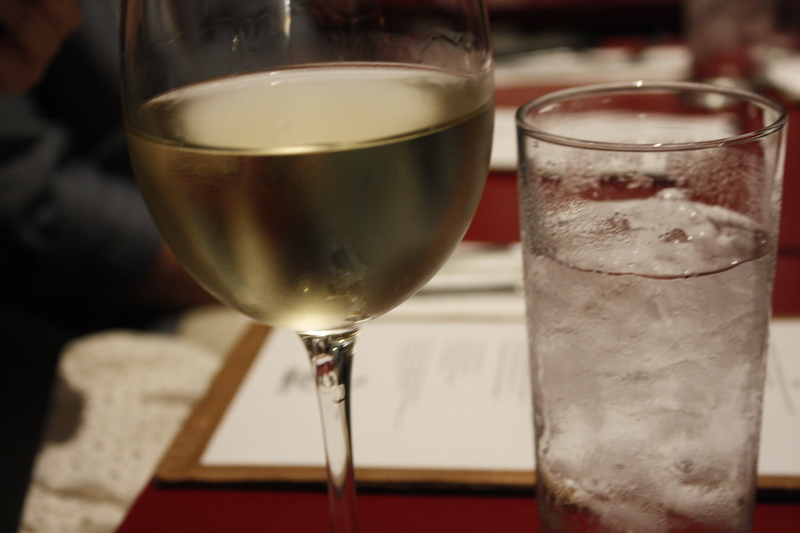 Our server was straight forward and all about business, responding to questions and explaining the menu. The menu has changed since my sister’s visit so she was temporarily disappointed that the cauliflower with chorizo with chorizo, cojita, pickled red onion ($8) and the caramel chocolate pots were no longer on the menu. I believe the fleeting nature of an ever-changing menu makes one savor and appreciate the dishes once had. It also means, time to try something new. There were many sides and items on the makeshift cardboard clipboard which we had considered and decided to wait for next time (sparrow arugula salad with green goddess salad and the mushroom man mix). Love the logo of the siloin strip steak dancing. Several folks had a glass of reisling, beers and we had considered the non-alcoholic root beers, orange sodas from local soda makers. 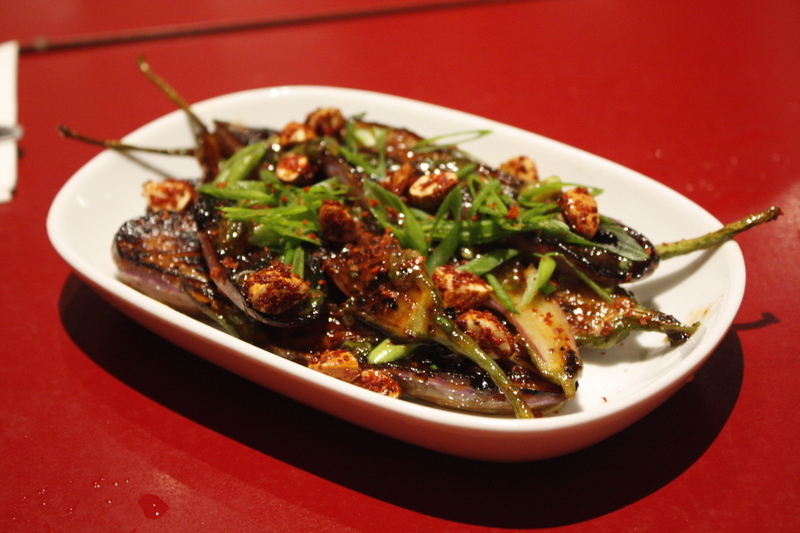 We started with the roasted fairytale eggplant with almonds and pomegranate molasses for $7. The less seedy petite eggplants were nicely melty, soft and had a nice skin. The combination of the rich nuts with the vegetables and the tang from the pomegranate molasses sauce was really enjoyable and a nice beginning. Just don’t eat the stems. 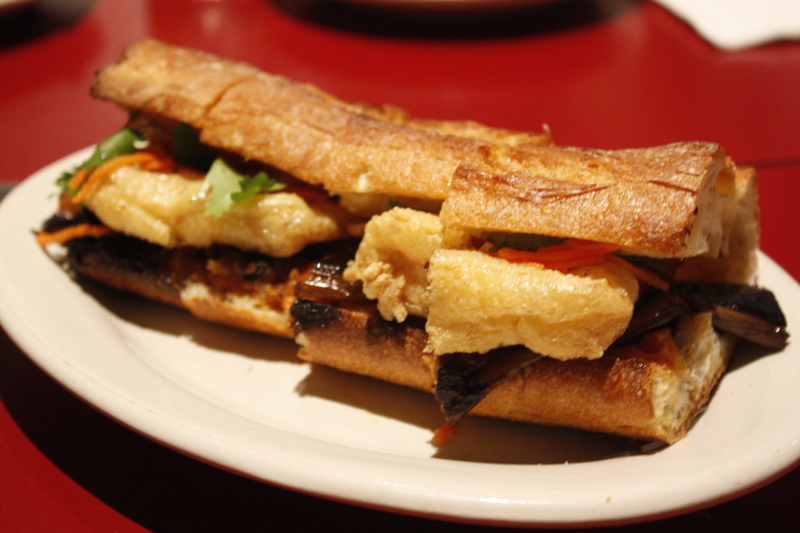 The Japanese eggplant banh mi with crispy tofu, pickles, cilantro for $9 was one of the best items we sampled and would love if this banh mi rendition was served here within Boston. 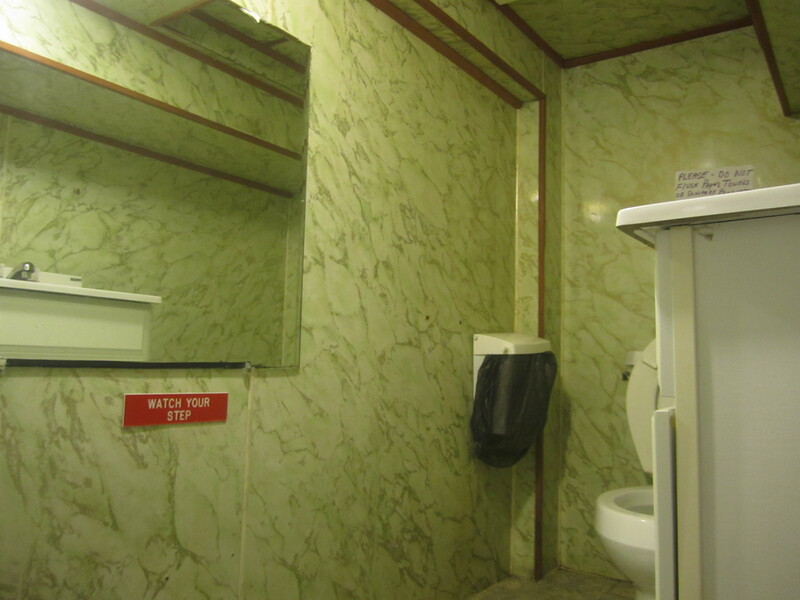 At first I was confused. Was this sandwich heavy on the salt or is this just intense flavor? After I wrapped my mind around the level of seasoning and idea of extreme notes of flavor. The crunch baguette was perfectly warmed, the super fried tofu has a bit of a greasy feel, but the soft, tender tofu creamy interior went well with the eggplant’s flavor. The thinly sliced pickled carrots, sprigs of green cilantro and a kick of heat was typical Vietnamese banh mi, but had another level of intensity brought together the sandwich harmoniously. 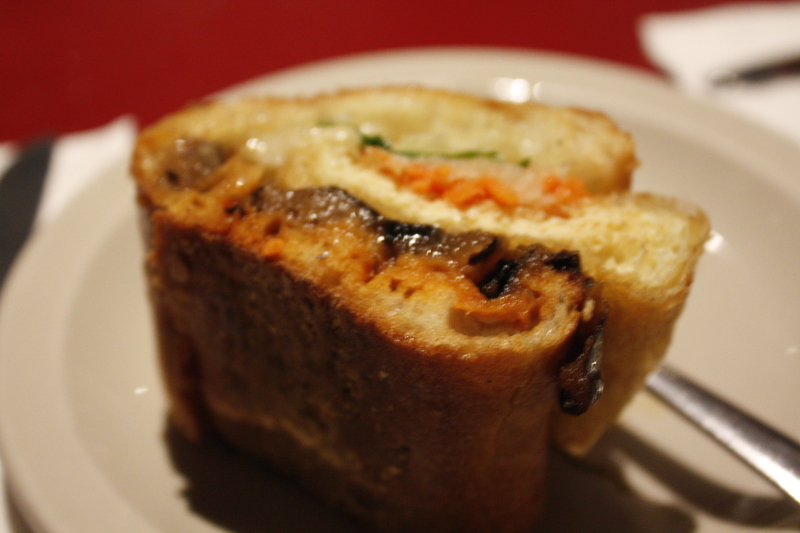 We all sampled the banh mi and LOVED it. Another please? And Just for myself! 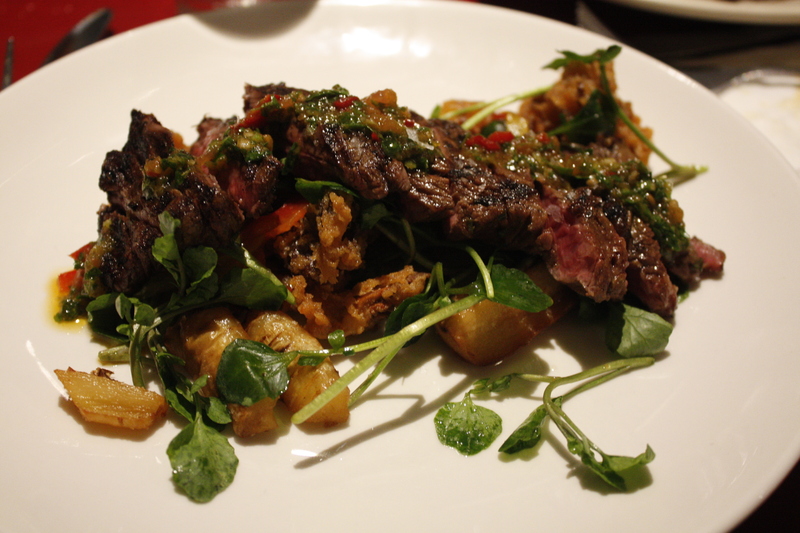 The grilled skirt steak was perfectly medium rare and pink on the interior and nicely charred for $18. The dish was a clever interpretation of a Latin classic with another Asian hint of tempura fried maitake mushrooms, the bright chimichurri and the watercress, pickled peppers and fried parsnips. 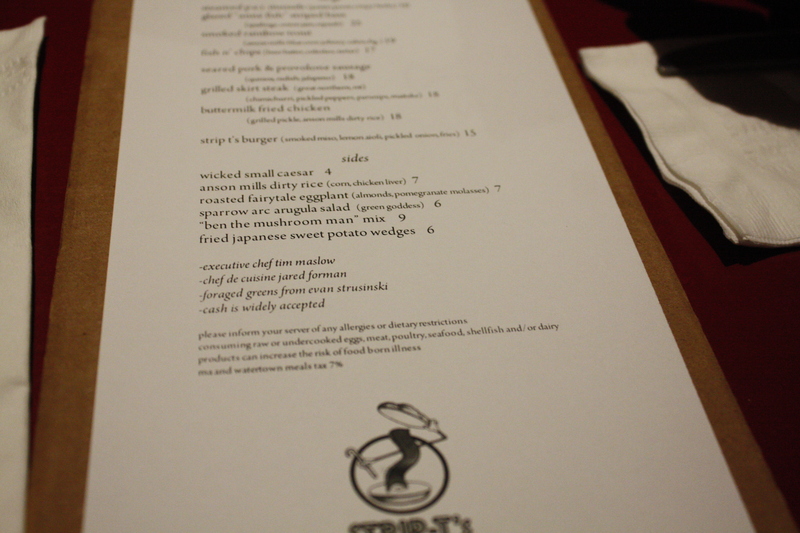 Loved the tempura maitake and nuggets of fried parsnips. The tang of the peppers went really well with the entire dish. It was light, flavorful and a pleasure. 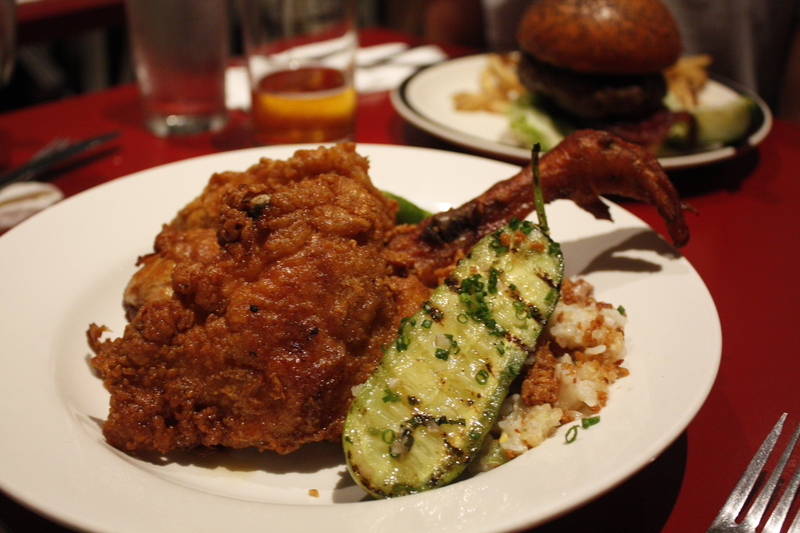 The generously sized buttermilk fried chicken had super tender meat, with really nice lightly seasoned crust for $18. 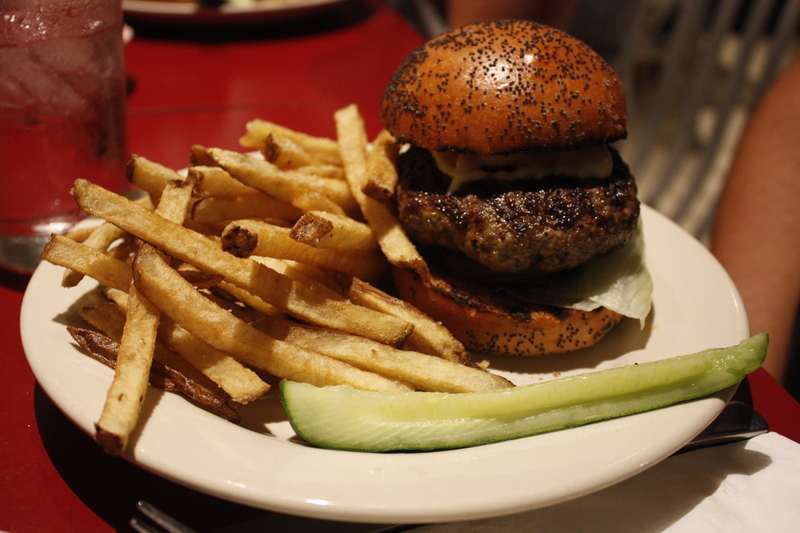 According to Boston’s Eater, this is Boston’s #1 most iconic dishes. We would love this drumstick and wingless (they must use the parts for the moxie wings) buttermilk fried chicken any day, especially since it is half a chicken. The chicken came with the chicken claw, which one of us gnawed off the batterless skin. If only the claw was battered and seasoned too. The pickle locked nicely grilled. The dish came with Anson mills dirty rice had little bits, corn and we think there was liver or an ingredient which made the dirty rice really creamy and on the heavier side. We just wished there was Latin dirty rice and beans, butter grits, potato mash or some parsnip puree. A majority of our table tried the Strip T’s burger and one diner substituted an paid an additional few dollars for the Fried japanese sweet potato wedges and miso mayo for $6. We love miso mayo, first fried at Mei Mei Street Kitchen (BMH’s visit to Mei Mei Street Kitchen). The well seasoned orange potato wedges were previously in chicken fat before they were fried. How awesome is that? The combo of the sweet and the creamy flavor of the miso mayonnaise was just perfect. Must get these. The Strip T’s burger was so good. The burger has a Iggy’s bun slathered with smoked white miso butter, lemon aioli, pickled onion, well seasoned hand cut fries was $15. The regular fries were perfectly salty, tender on the inside and had a nice skin and crisp. These didn’t need miso mayonnaise. We ordered the burgers medium rare and our server explained that the burger would not be pink inside, but is measured for the exact medium rare temperature. 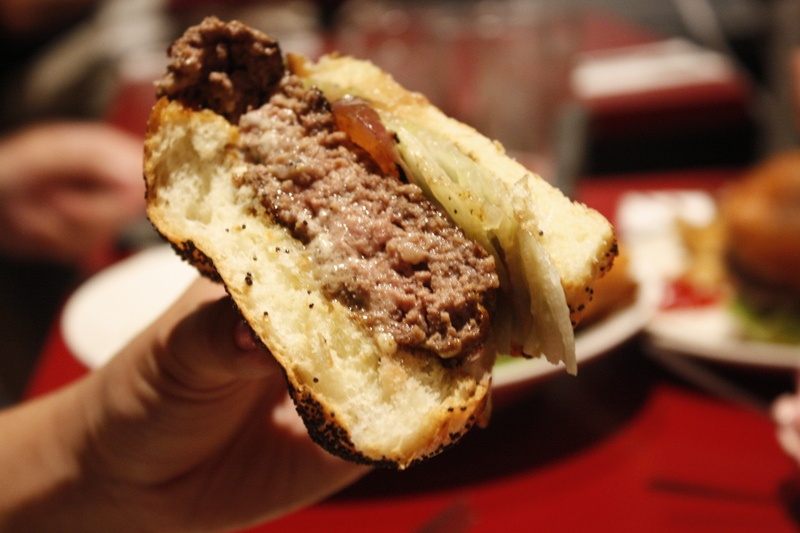 The meat color is brown throughout because of the in-house burger meat mix and process. 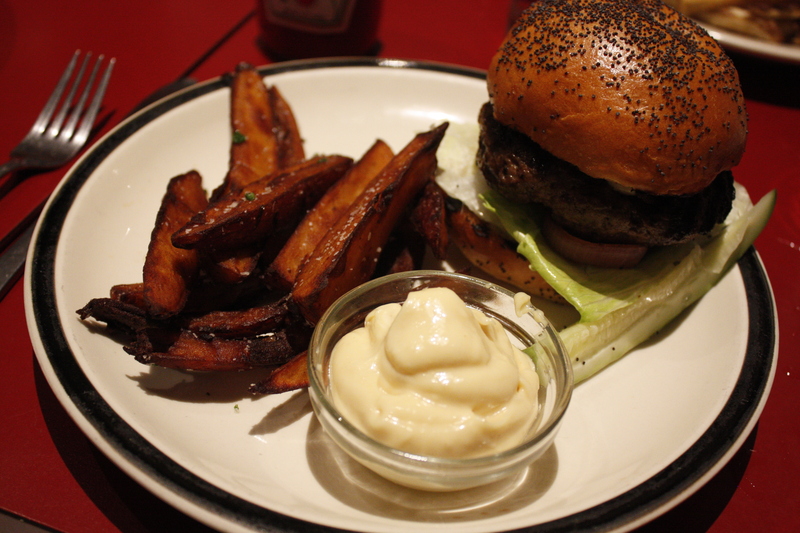 Initially, we had to rethink if it was medium rare, but the burger pattie was juicy and very flavorful. This burger definition of ultra umami. The flavor of the meat was very strong and very bacony and porky. 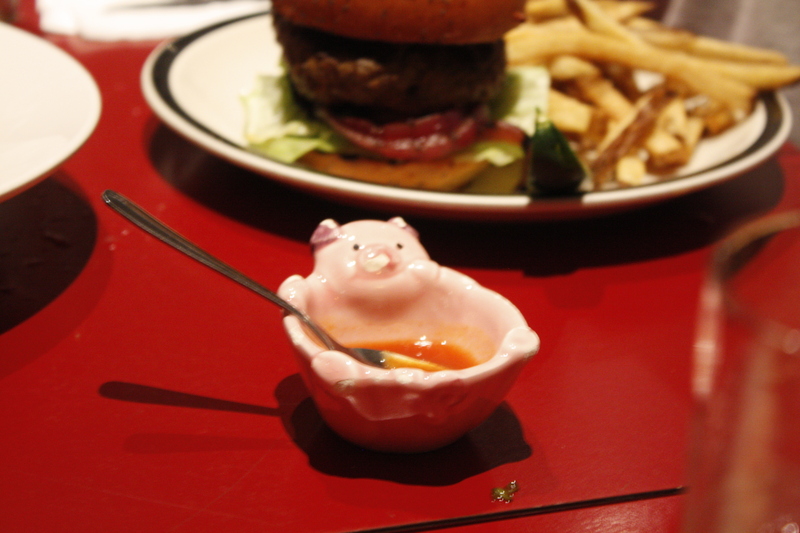 A little pink friend came out with a belly fully of tabasco. Loved the idea so much. Although we were nearly tempted by the Goat’s milk panna cotta raspberry, coconut cake and the Fried brioche donut with blueberry pastry cream, lemon frosting, both for $8, we were stuffed. 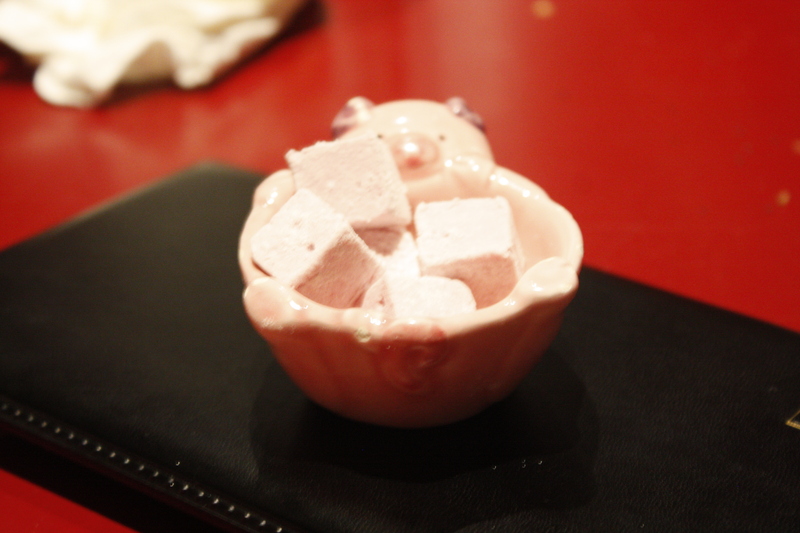 We were greeted by our little pig ramekin filled with cool homemade berry marshmallows. They were pillowy, chilled and the perfect sweet ending for us. This whimscal nature of the Strip T’s dining experience was wildly appreciated. Maslow demonstrates reinterpretations of classics can be executed with a cerebral touch and humorous flair. We will have to back to enjoy the clubhouse like restroom again and try the Grilled romaine witb oxtail, poached egg, chili vin for $12.